Southern California/Hermes Copper: Wildfires have destroyed critical habitat sites for this species which has yet to receive endangered status. At the same time, although prescribed fire can be a useful management tool, in some situations it is detrimental – especially as the range of a species is drastically reduced. Klotz’s Bog – New Jersey/Georgia Satyr, Two-spotted Skipper, & Bog Copper: This site is about the marching of succession. The vegetation here is maturing beyond the usefulness to the rare Georgia Satyr, Two-spotted Skipper, and Bog Copper, and this site requires management to provide the growth of a more immature biome. Prairie/Poweshiek Skipperling, Dakota Skipper, Otoe Skipper, Regal Fritillary, and ‘Pawnee’ Leonard’s Skipper: The preservation of tall grass prairie ecosystems is crucial to the endangered Poweshiek Skipperling and threatened Dakota Skipper, Otoe Skipper, Regal Fritillary, and ‘Pawnee’ Leonard’s Skipper as their habitats have been degraded by development. The grasses and forbs critical for the life history of these butterflies are controlled with widespread glyphosate and other herbicide use. Systemic and topical pesticides employed to control true insect pests are adversely impacting whole assemblages of native organisms. Extirpation of large mammals, namely bison and elk have removed major drivers of ecological function from the landscape. Butterflies are the canary in the coal mine for landscape-level impacts to the ecosystem. As these butterflies go, so go other wildlife. 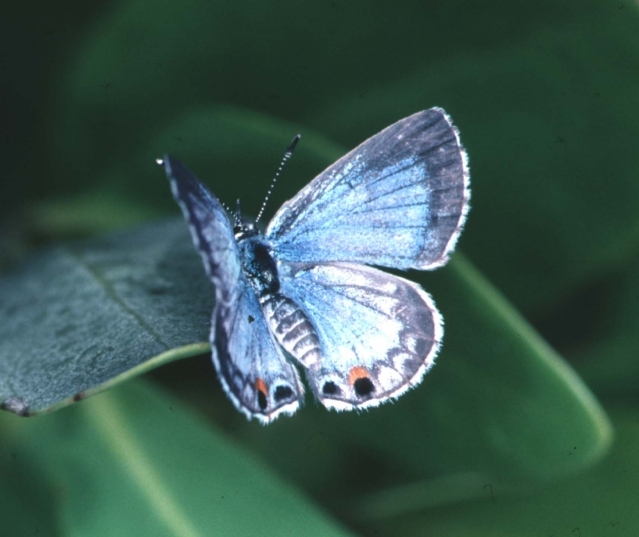 South Florida/Miami Blue, Schaus’ Swallowtail, Florida Leafing, and Bertram’s Scrub-Hairstreak: We are seeking to re-establish the Miami Blue and support the Schaus’ Swallowtail, Florida Leafing, and Bertram’s Scrub-Hairstreak. Housing and commercial development has been obliterating these species’ habitat. Mismanagement led to the death of the captive population and destruction of the butterflies’ host plant on state land.